With vendors’ help, banks can provide commercial clients actionable analytics-based information—not just static reports. Boston, November 2, 2016 – The amount of payments data available to North American banks has grown exponentially as more electronic payments are processed. Analysis of this payments data could result in the development of new products and services for banks to offer their clients, but banks have shown very little pursuit of this opportunity. Could banks rely on vendors, at least in part, for the development and delivery of payments-analytics-based services and products to their commercial clients? 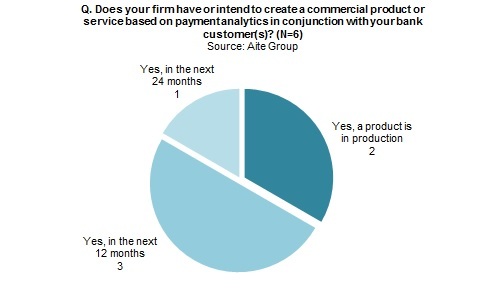 Based on a Q3 2016 Aite Group survey of key vendors in the payments and cash management space, this report introduces six vendors and indicates what services they have or are planning that will help banks deliver payments-activity-related information to their clients. These vendors—ACI Worldwide, D+H, Fiserv, Intellect Design Arena, Misys, and Q2 Software—are developing or plan to develop products or services that will help banks provide compelling actionable information in various forms to their commercial, corporate, and small-business clients. This 18-page Impact Note contains 10 figures and four tables. Clients of Aite Group’s Wholesale Banking & Payments service can download this report, the corresponding charts, and the Executive Impact Deck.